The first of the Basil Rathbone Sherlock Holmes movies, and one of the best. In this movie we are introduced to Holmes with the deerstalker hat, the violin, the disguises and the ability to tell things about a person by just looking at something they owned. We are also introduced to Dr. Watson, who is not bumbling here, but more faithful to the character portrayed in the books. The movie is fairly faithful to the book and takes place on the moors of Devonshire. The plot is simple but as in most of the movies in this genre the fun is watching Holmes and Watson. The last line of the movie, "Oh, Watson, the needle! ", was edited out in many early versions of the movie. Nice blog with cool stuff about Sherlock Holmes. 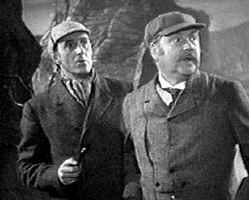 Rathbone is one of my favorite Holmes, along with Vasily Livanov. I recommend the Russian adaptation with Livanov as Sherlock Holmes. I am sure it will appeal to the Sherlock Holmes fan in you.